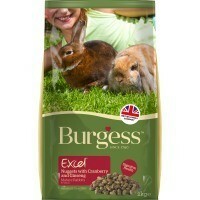 Burgess Excel Mature Rabbit Nuggets with Cranberry & Ginseng is a delicious, complementary food with special ingredients to deal with some of the problems that age brings, such as joint stiffness and a lack of energy; it also helps to keep weight under control. Grass Meal, Oat Feed, Wheat, Soya Bean hulls, Peas, Barley, Un-molassed Beet Pulp, Yeast, Thyme, Ligno-cellulose, Limestone, Fatty Acids, Soya Oil, Short Chain Fructo-oligosaccharides 0.4%, Ginseng 0.34%, Monocalcium Phosphate, Salt, Cranberry 0.1% Glucosamine Hydrochloride 0.04%, minerals. My two 7½ year old rescue bunnies absolutely love this and you wouldn't think they're middle-aged/elderly! The pellets are fairly small, so Billy, who has dental problems (due to neglect before he was handed over to the RSPCA) can eat them without problems, and they fit perfectly in their treat ball, which the spend hours playing with! I have a mix dwarf doe over 7, but you would never know it. She's bright, active (there's a veritable warren in my raised beds she's dug all by herself) and bosses her big chubby buddy around. She's been eating this for two years and she loves it (they both do... but the buck will eat anything). I didn't think that this would make much of a difference to my eldest bunny who is now 7 years old. He has been eating this for just over a year now and he loves it! He appears to be far more active and agile, plus his coat now gleams with good health even when he's moulting. He has always been fed on Excel pellets so moving up to Mature seemed a natural progression. Can't recommend this highly enough. If you have a bunny over 5 years old, really think about moving them on to this, they will thank you for it.